You are currently browsing the category archive for the ‘around the house’ category. Yikes, that yarrow on the bottom left is looking more than a bit sad. I’m happy to report that he’s perked up a bit since Thursday morning, however. If he doesn’t continue to perk up, there’s always Home Depot’s exchange policy. I’m pulling for him, though. As for the mums, I’m surprised at myself. Or maybe that’s my favorite part. Seeing them learn new chores makes me happy. And Garden Week!™ rolls on! Yesterday was Flower Buying Day. We started our hunt at Home Depot’s clearance racks before moving onto the main nursery section. I’m nothing if not cheap budget-minded. Mums! I’ve never been much of a fan, but they’re so cheery, aren’t they? Blanket Flowers (Gaillardia). I’ve never heard of this one. It’s full and pretty. Dahlias! These are gor. geous. Absolutely brilliant. Oh, how my farming ancestors would have laughed at me, buying dirt from a store. What a different world we live in. Tomorrow on Garden Week!™ — the finished product. I used to work at a certain store that had that phrase on the back of its employee t-shirts. Customers asked all. the. time. how they could get one. Sadly, no can do. However, in an attempt to (a) do something fulfilling with the boys, (b) make some pretty, and (c) work on that list from the beginning of summer, I’ve declared it Garden Week!™ here at Camp Mom. Seeing as this house, and therefore its yard, does not belong to us, a container garden it is. I’ve broken Garden Week!™ down into daily steps to better keep the boys’ interest – and my sanity – intact. My original thought was to go thrift store shopping to get all the containers. That original thought became shocked resolve when I looked at the price of new pots and planters – $28-$45 apiece? Wow. 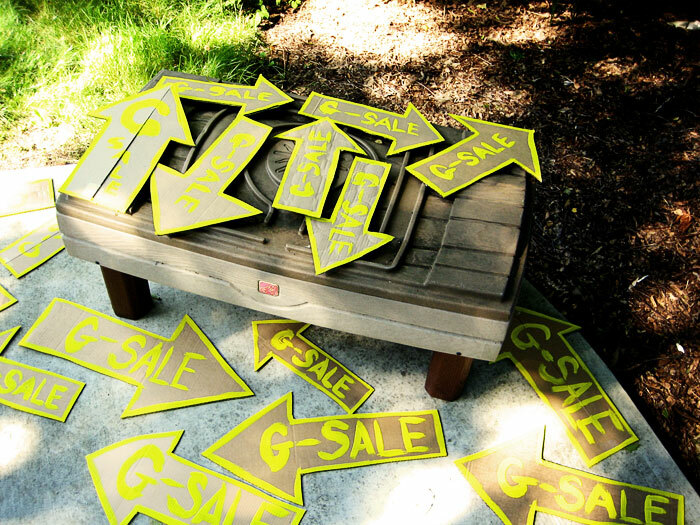 So, yesterday, the boys and I hit the thrift store circuit. Selection is low. Okay, okay, I know it’s August, and most on-the-ball people started their gardens much earlier in the summer. Or spring. But still. NOTHING at the first three stores. What we did find was cracked, chipped, or plain old ug-lee. Goodwill, though. Goodwill came through for us. There’s a shy one hiding in the red planter, too. He wasn’t too keen on hopping out during the photo session. Or I forgot about him. Either way. Tomorrow on Garden Week!™ – Day 2: Buying flowers! No pun in today’s title. A double meaning, maybe. But no pun. Remember, back in February, when I showed you how we convert the kids’ play room to a guest room? That’s not quite all of it. There’s something we’ve started hanging up in there to make our guests feel a little more special. 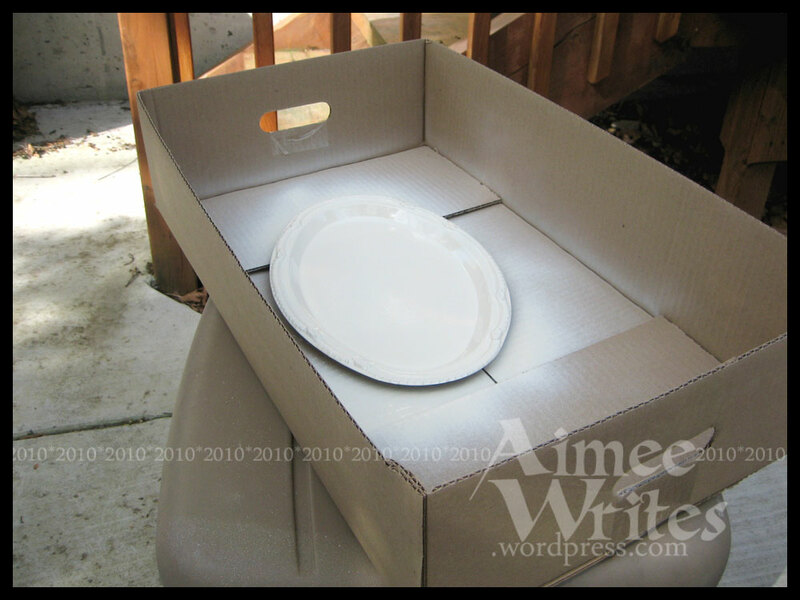 1 ~ Use an old manila folder to create a diamond-shaped template. Diamonds folded in half, of course, make triangles. Trace the diamonds onto newspaper. Make sure you’ve already read the newspaper, if you want to, because it’s going to get ruined. 2 ~ Water down acrylic paints just a bit, so the newsprint will show through. 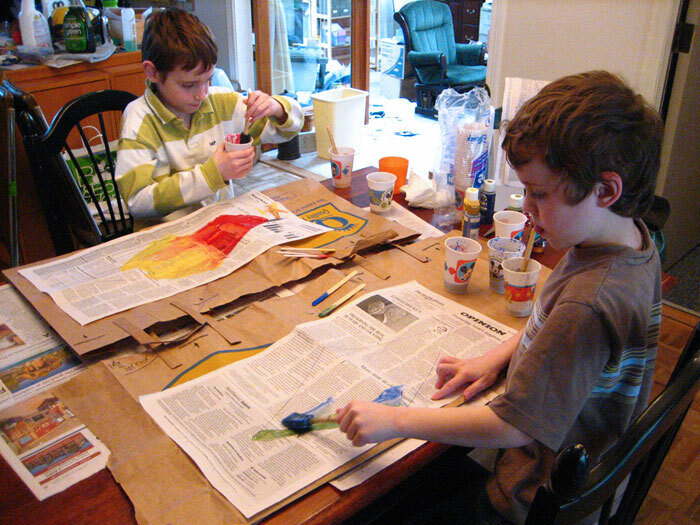 Be sure to keep warm colors separated from cool to prevent muddiness. Notice that I gave Nicolas all the reds, oranges, and yellows, and Kalen had the greens, blues, and purples. 3 ~ Paint! Go hog wild. Go outside the lines! It’s abstract! It’s fun! 4 ~ While the paint is drying, cut out letters that will fit on the folded triangles. I wanted to print perfect letters in a pretty font from my computer but decided to embrace the child-like, handmade look of it all. I hand-drew the letters on construction paper with Sharpie and cut them out. W’s and M’s are particularly difficult; just thought you deserved fair warning. 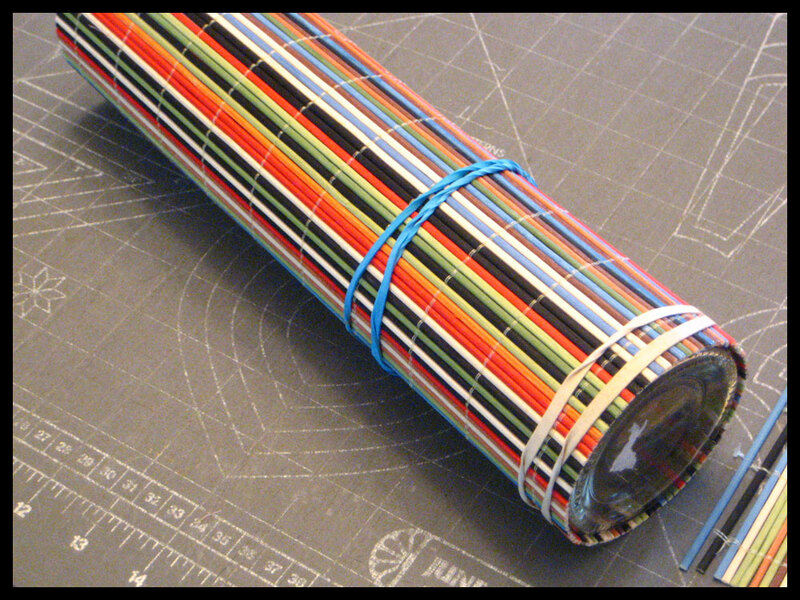 5 ~ Choose a string/ribbon/something-like-that to hold all your triangles. I found some red paper twine in my stash and braided it with raffia. Cut the [dry] diamonds out, fold them over and glue them around the s/r/s-l-t. Reinforce the top with a staple, if you’re concerned they might slide around a bit. 6 ~ Attach the letters. 7 ~ Hang. You know all those looooong plastic twist ties that hold toys in their packaging and generally make birthdays and Christmas morning so frustrating? Jason’s always insisted on keeping them and storing them out with the hardware in the garage. I cannot tell you how often they’ve come in handy. I use two to attach the bunting the curtain rod. The hardware’s a little much for a paper banner, but I might get curtains in there someday, too. Maybe. It was a fun, free project that took us only an hour or so one afternoon. Folded up, it fits nicely in the drawer with the guest room alarm clock. 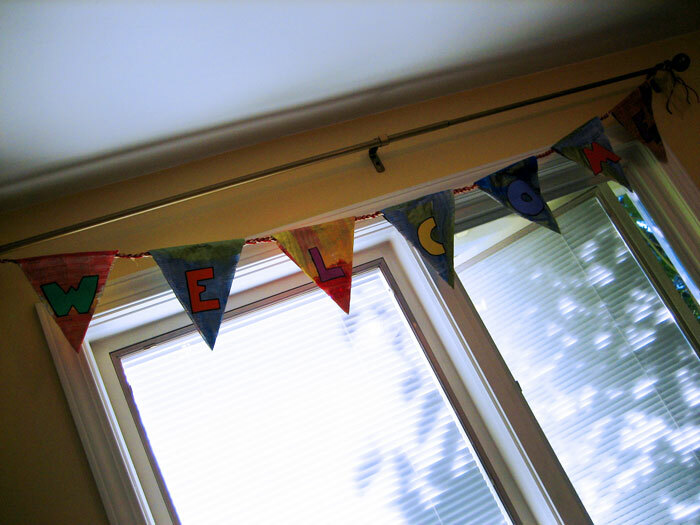 Unfolded and hung, it shows our guests how happy we are to have them. 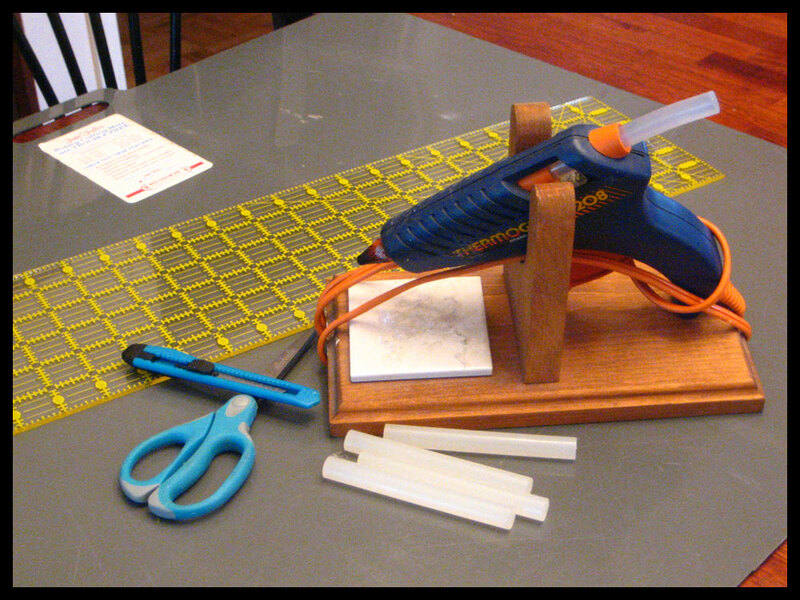 Quality time with boxes, a box cutter, and yellow tempera. I made 20 arrows and was concerned it wouldn’t be enough. (There are a lot of twists and turns here.) I finally took Jason’s advice (See, Honey? I do that sometimes!) and printed out a map of our neighborhood. Turns out twenty is exactly the right number. Did you know that the combination of black on yellow is one of the easiest color contrasts for the human eye to see? Even better than black on white. Tonight, my quality time will be with my black Sharpie. Outlining, lots of outlining. *It should be noted that this statement was typed without an ounce of sarcasm. I really do love this sort of thing. I’m a dork — and a dream come true to teachers who hate decorating their classroom bulletin boards! 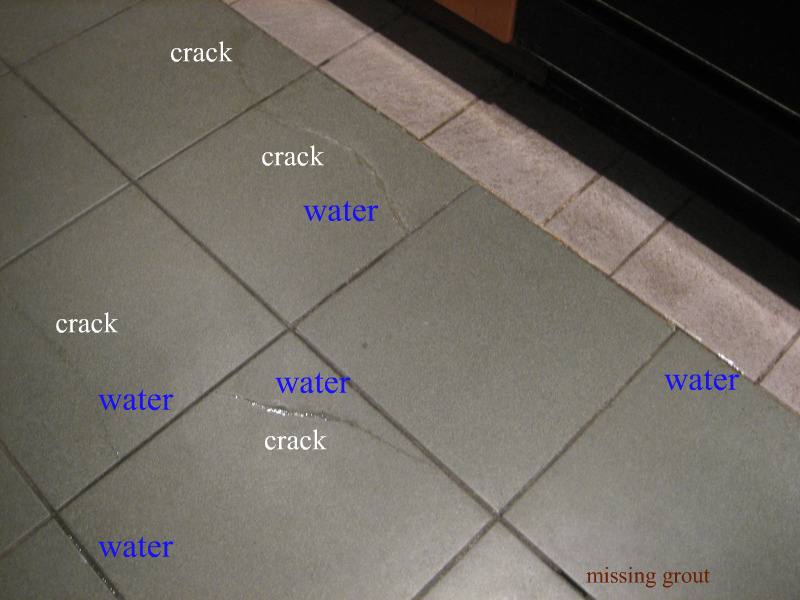 Walking across the kitchen floor, I thought I felt a tile shift underfoot. Hmm, odd. Walked back and forth a bit, couldn’t recreate the motion, figured it must be in my head. Sweeping the kitchen floor, noticed grout from between the floor tiles mixed in with the dust bunnies, cheerios and broken pasta. Okay, that’s not good. We had guests coming in a couple of hours, though, so I figured I’d call the landlord Monday. Our landlord, Roger, came out to see the damage. He apologized profusely that we had to deal with this, but hey…I feel a lot more badly for him. He’s the one who has to coordinate the repair work. Our main concern was that we didn’t know how long the issue had been going on. 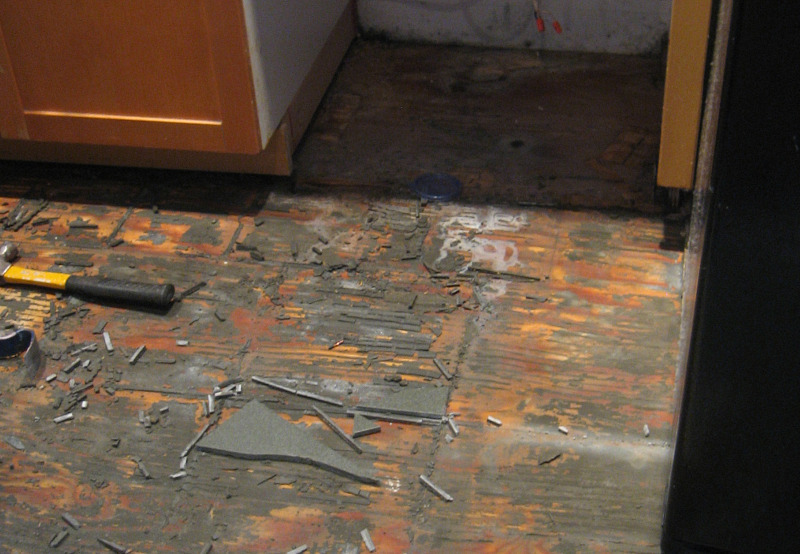 Would the sub-floor have damage? Jason looked under the dishwasher. YUCK. Has anyone ever cleaned under their dishwasher? As in, removed that little panel at the bottom and seen what’s back under there? I haven’t. Nasty. Me: popping Tylenol Sinus and Zyrtec to fight the mildew-and-pounding-induced headache. Inhaler: at the ready for both Kalen and me, just in case. Windows: open. 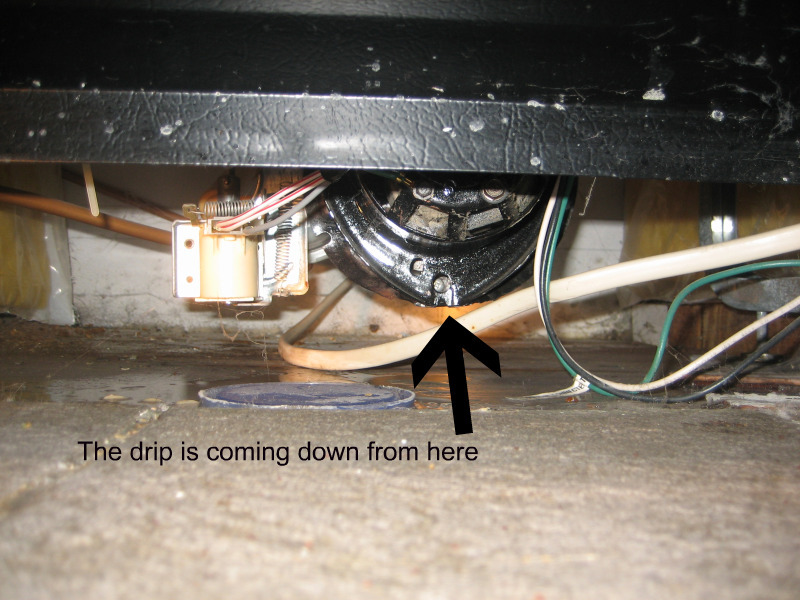 Dehumidifier: running full-blast. The question gave me pause. Nicolas was doing his homework one afternoon last week, and the question came suddenly, seemingly out of nowhere. I’ve been pondering this for a week now. 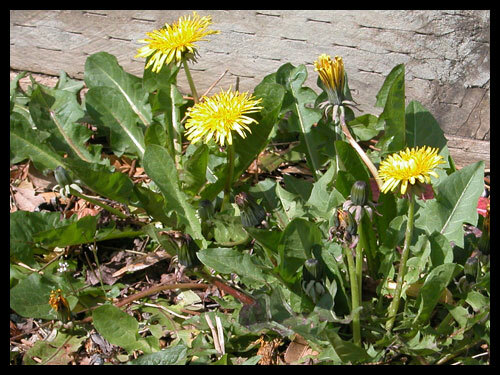 I find myself driving past yards full of dandelions, yards that would have homeowners’ associations sending scads of scathing letters. This notice is to remind you that keeping your lawn weed-free will result in a more beautiful neighborhood, thereby keeping all of our home values at a desirable level. 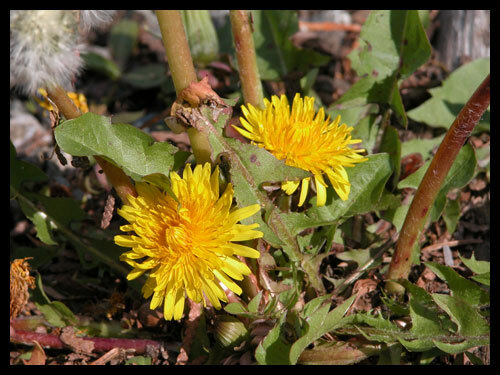 Failure to remove the weeds within fourteen days of receipt of this notice will result in removal of the weeds by the HOA at a cost to you of $250. Every time I’ve passed a corner, a house, a field covered in dandelions recently, I’ve found myself enjoying the sight. Drinking in the floral sunshine. Smiling at the tiny bursts of color. 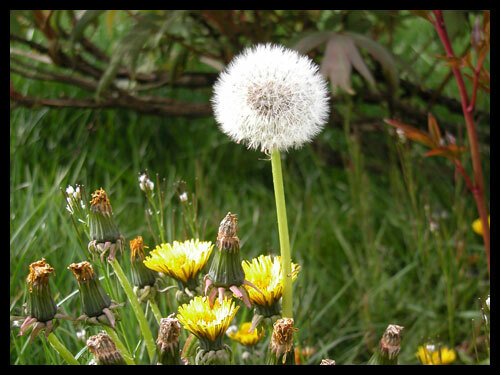 A number of dandelions have moved on to the parachute stage, ripe for hands young and old to pluck them. Make a wish and blow! So, are the weeds actually bad? Or is it just that we want to pretend we have control over nature? Choose the plants we want in our yards. Show our mastery by kicking out the baddies! 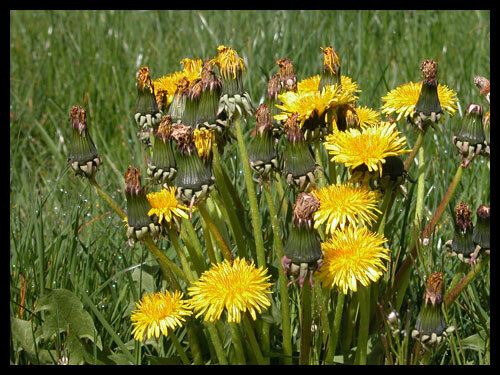 Begone, beautifully foul dandelions! 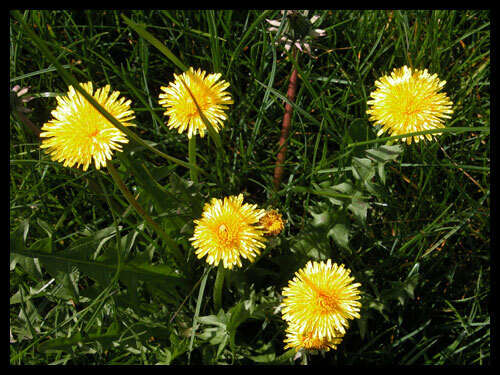 I’m finding myself in love with the dandelions this year. I find myself not missing someone else’s idea of what makes our yard beautiful. 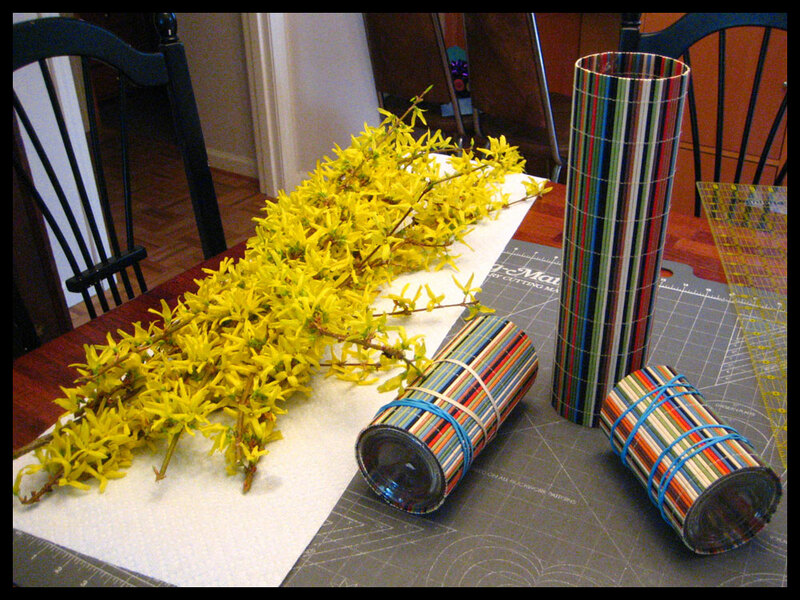 Earlier this month, I posted a tutorial for bamboo vases, and after using them for three weeks, I have to say I’m still in love with them. This week, I finally got started on my second project. 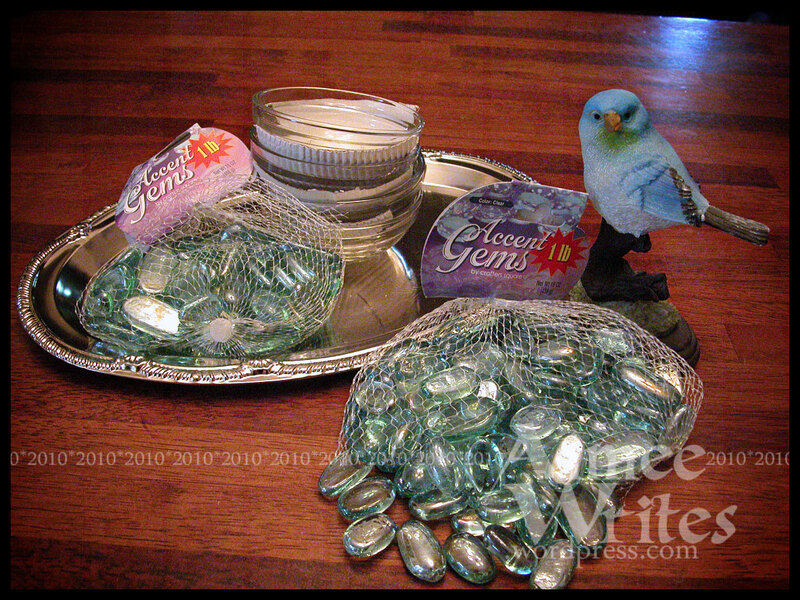 Items on hand that I used: Spray paint, spray poly, and a bag of tea lights. 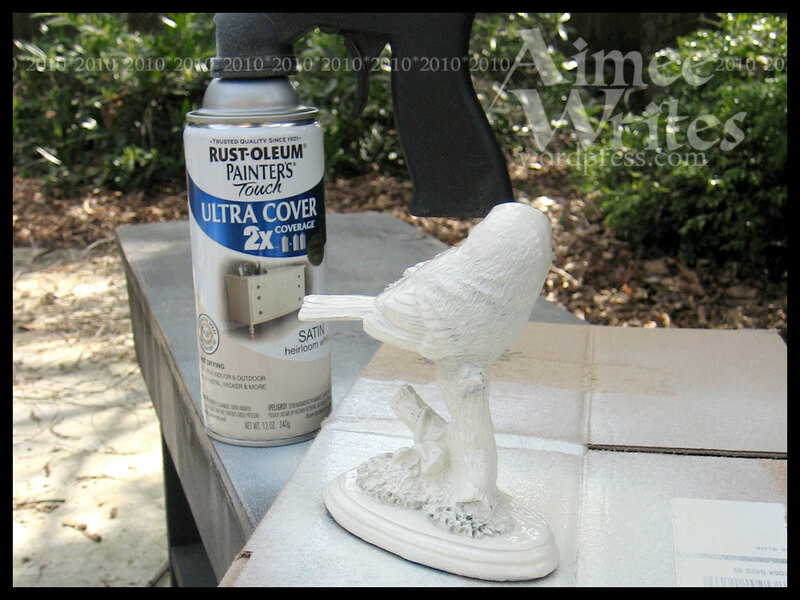 I went in wishing I had a brighter white paint for this project, but I only had Heirloom White on hand. It always goes on creamier than I want it, but now that it’s dry, I’m pretty happy with it. After they’d spent a couple of hours basking in the sunshine, I brought them inside to cure overnight. Hmm. Seems I didn’t need the bowls after all. Okay, so it’s a $4 project! 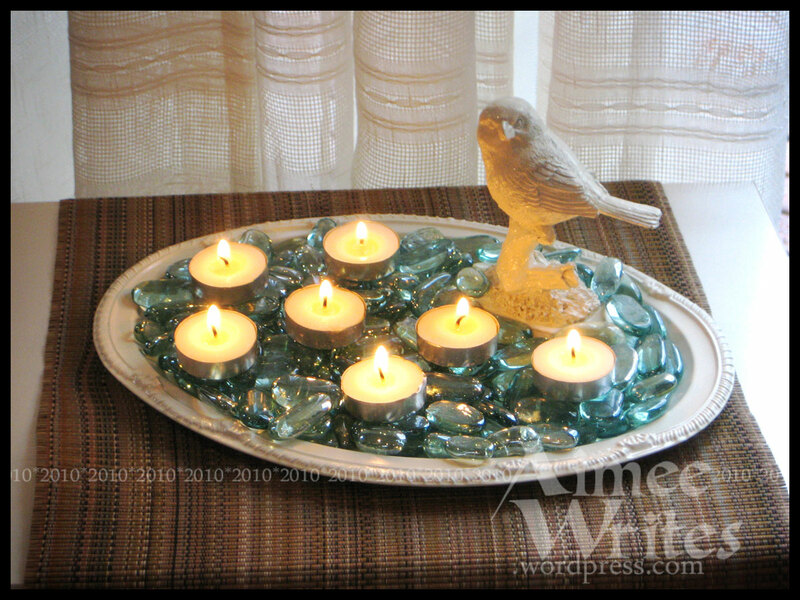 If you have clear cup tea lights on hand, I think it would be even prettier. I’m fresh out. P.S. I’m also linking this up to the Frugal Friday Linky Party over at The Shabby Nest. Have fun looking through those projects, too! *This isn’t the steadiest candle arrangement in the world…As with all candles, please don’t put this anywhere a child or animal could disrupt it and get burned or spread the flames. And, of course, don’t leave it unattended! You knew that, right? 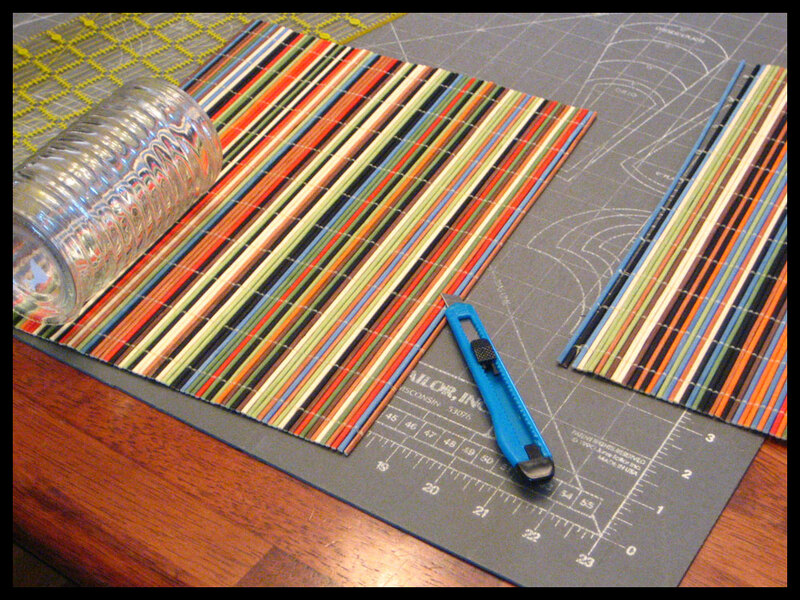 I was inspired to make vases the instant I saw these colorful bamboo place mats. I spent about ten minutes playing with the glassware at the store to make sure I could make the number of vases I wanted with only $5 worth of stuff. 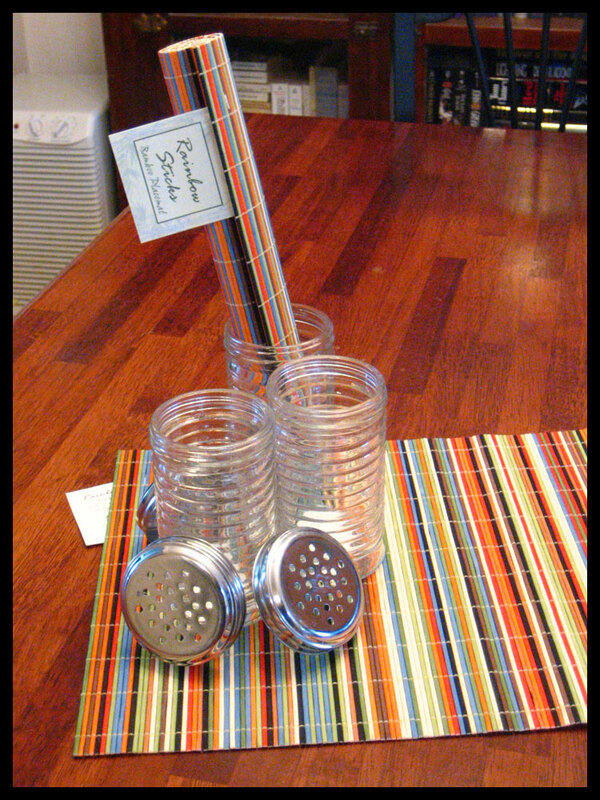 I began by setting the shakers’ tops aside (they might come in handy for another project someday, right?) and wrapping a mat around one of the shakers. I then cut the mat to just fit around the shaker. I figured out pretty quickly that you’ll want to secure the end pieces of the mat immediately with some hot glue in a couple of places, to keep it from falling apart. Once the strings are cut, the bamboo sticks will pop off and scatter like mad. 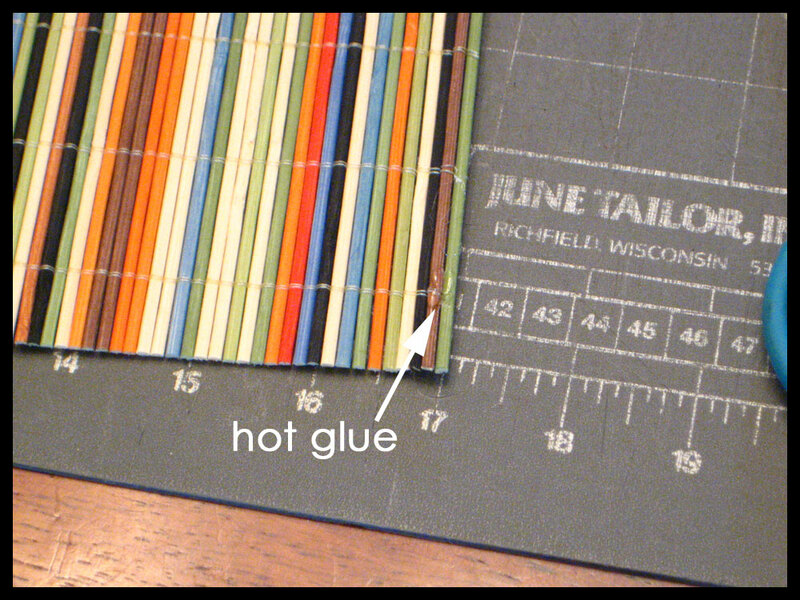 I then applied hot glue to the mat and carefully wrapped it around the shaker, being sure to line the bottom edge of the shaker up with the bottom edge of the mat, and secured it with rubber bands. My plan was to come up with three vases of different heights. 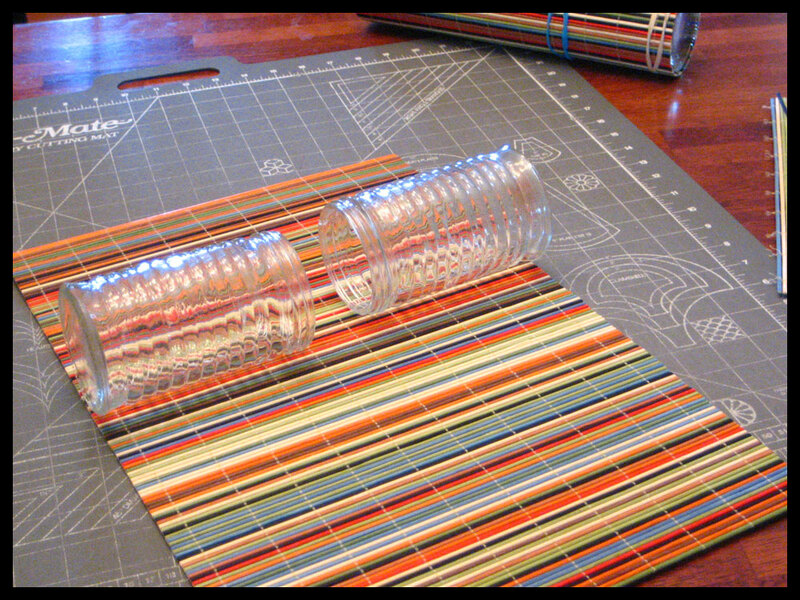 Here’s where I spent my time in the dollar store: making sure that I could get two shorter vases out of one place mat. The manufacturers of the “sugar” shakers were quite helpful and made them exactly 5 inches high. So, I measured and drew a line 5″ from the edge of the mat with my silver Sharpie. I scored it a couple of times with the craft knife (I put a fresh blade in first!) before cutting it with my scissors. The scoring helped keep my scissors on track, and I ended up with a pretty straight cut. I cut and applied the two pieces of mat to their shakers and set them to dry/cool while I hit the yard for some appropriately springlike blooms. 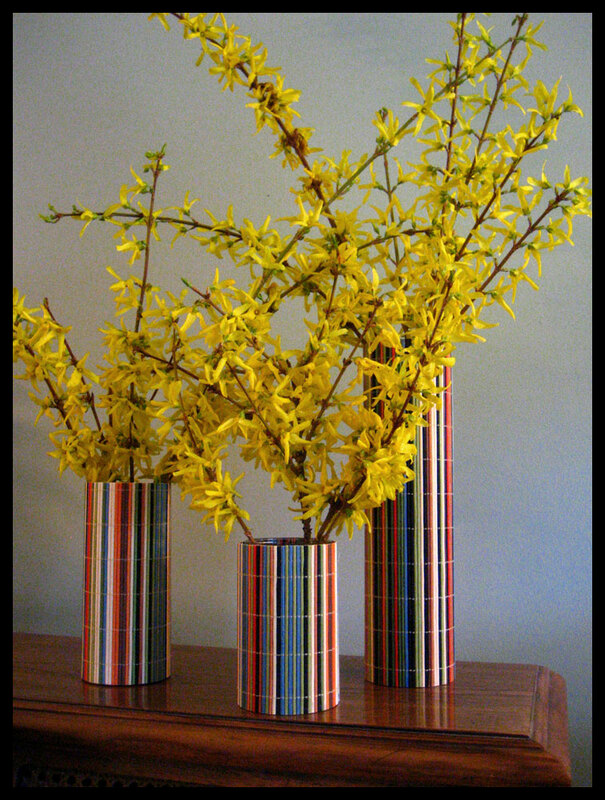 Doesn’t forsythia scream “Spring is coming!!”? It reminds me of my parents’ yard in Georgia. By the time I had the stems de-budded, the vases were all ready for some water, flowers, and a photo shoot. Don’t they frame the boys nicely? I’m thrilled with my new $5 set of vases. 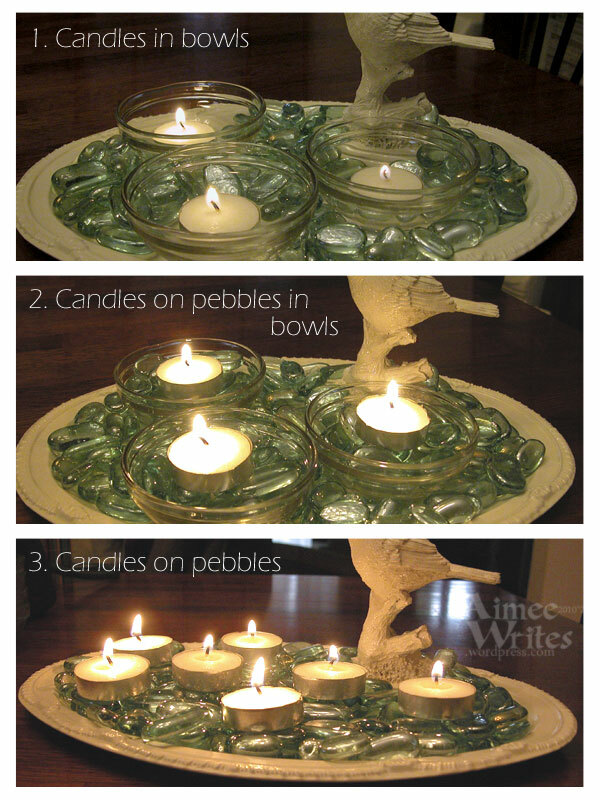 It occurs to me that they might make nice tea light holders, too. 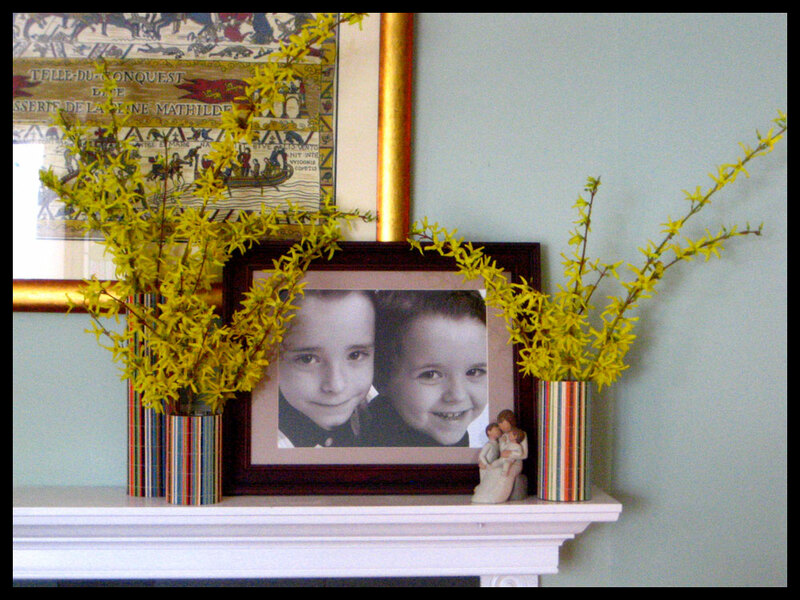 I’ll give that a try with the forsythia dies and let you all know how it works out. So how about you? Are you up for Lindsay’s challenge?